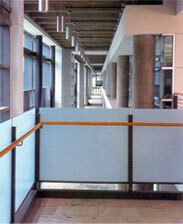 Lets you achieve the look of etched glass, at a fraction of the cost. Opens unlimited design possibilities, allowing you to bring vibrant color, visual effects and graphic patterns to glass surfaces in commercial and residential spaces. Gives you new power to impart privacy and enhance safety in commercial spaces. SunTek glass enhancement film puts a new world of creativity, functionality and flexibility within your grasp. You can bring color and texture to virtually any glass window, door, or room divider. Subtly or sensationally. SunTek decorative film puts multiple colors and patterns at your disposal: red, yellow, green, blue, bronze, white, black, matte, frost. Combine any or all to splash on virtually any color. Achieve any hue. Diffuse, focus, or block light completely.